One of the Battlefields Trust's explanation boards at Turnham Green, London. View the locations of the Battles of Brentford and Turnham Green on an interactive map. Marston Moor. Definitely Marston Moor. Though there is Cheriton ... Come to think of it, how about Stow-on-the-Wold? Each has a claim, though a recent Battlefields Trust walk made a strong case for the Battles of Brentford and Turnham Green to be considered the most significant military event in the English Civil War. Buoyed by his perceived success at the Battle of Edgehill in October 1642 the King made for London. Unwilling to sanction Prince Rupert's plan to strike on the capital before the Earl of Essex returned he opted for negotiation, only to be turned back from the capital at Turnham Green. The significance of this précis of events in the history books appears incongruous. It's generally accepted now that once the King had failed in his only real chance to take London he had lost the chance to bring the conflict to a swift and early conclusion. However Brentford and Turnham Green receive far less attention than the other battles mentioned above, often appearing as little more than footnotes in some English Civil War histories. I skimmed through half a dozen readers by well-known 20th century English Civil War historians: where the battles are briefly mentioned, it's only to note that the King was 'checked' outside London, or the events are recast as personal setbacks for Prince Rupert. I'll offer some thoughts on this later. A bit more background: following their perceived success at Edgehill, the King swept down the Thames Valley towards the capital. In early November 1642, with peace talks proving frustratingly slow, Charles commanded Rupert to take Brentford, eight miles outside of London on the western road. The Earl of Essex - allowed to return to London from Edgehill by Charles' dithering - had already prepared his defences, including the men of the London Trained Bands under Sir Phillip Skippon, to protect the bridges at Kingston upon Thames and Brentford. On 12 November a force of around 1,300 stood in defence of Brentford, ready to meet the approaching Royalist army of just under 4,000. The Lion Gates at Syon Park, designed by Robert Adam whilst remodelling the state rooms in 1769 (see the original drawing). It was in the vicinity between here and Sir Richard Wynn's house that the first engagements took place. Our walk would first take in the scene of the Brentford battle before moving further east to Turnham Green. Simon Marsh of the Battlefields Trust (co-author with Stephen Porter - who would lead the afternoon walk - of The Battle for London) met us near Brentford Magistrates Court from where we proceeded west on London Road to the gates of Syon Park, owned then, as now, by the Duke of Northumberland. It was from here, Simon explained, where the first engagement too place. A little further down the road towards the Brentford bridge was Sir Richard Wynn's house, and this formed a base for Denzil Holles's men in the Parliamentarian advance party to rebuff the initial Royalist attacks. Simon Marsh of the Battlefields Trust speaking to the group outside Syon House. The house was damaged by ordnance on one or both of 12/13 November 1642. 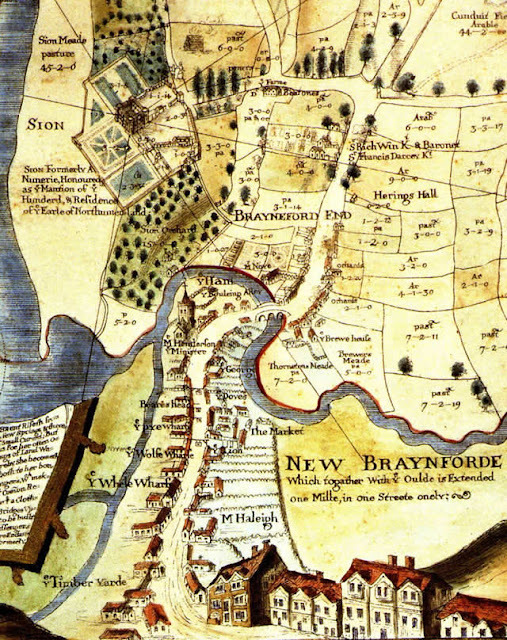 Moses Glover's 1635 map of the Isleworth Hundred showing the area of the battle. Fearful of the oncoming Royalists many locals fled, while others chose to stay and protect their property. One William Dunn, a butcher, escaped back into London to bring news of the Royalists' advance to Parliament, for which he was rewarded with £5. 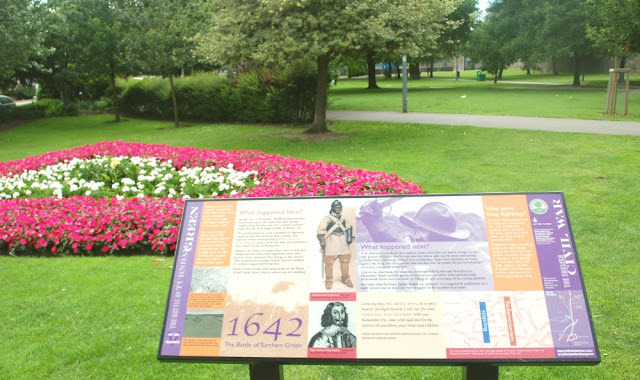 In 2007 the Battlefields Trust erected a number of information boards at Brentford and Turnham Green to commemorate the battles and help further awareness and understanding of them. The one on Brentford Bridge (above) faces east back towards the centre of Brentford. Falling back to the bridge the defenders had to make do with an improvised barricade. Outnumbered by a thousand or so attacking musketeers, Holles' men held the position for less than an hour, before abandoning that position to retreat a little further back up the London road and join another barricade manned by the forces of Lord Brooke. This position had the advantage of slightly higher ground; the Google map below (looking east) shows how the ground still rises from the bridge through what was 'Old Brentford'. After two hours of intense Royalists attacks, including hand-to-hand fighting, the second barricade was also lost. Many of Parliament's men were killed, including some who were forced down the bank of the Thames to drown in the water. What was left of Holles' men fell back on to the wider ground towards Turnham Green, where they joined the troops of John Hampden's regiment and the London Trained Bands. More hours of fierce fighting followed before nightfall. In the wake of the Royalists' advance Brentford was sacked, reputedly on the orders of Prince Rupert, though it's more likely that the marauding Cavaliers were simply following the unwritten rules of 17th century warfare. By evening around 140 of Parliament's troops were dead, with many more taken prisoner. Two of their regiments were lost, with only light casualties inflicted on the Royalist army. Progress towards the capital had been inconveniently slowed, but rather than use the day's military success to warn Parliament that a political settlement was the preferable option, the King decided to bring up the remainder of his reserve forces and press on in the morning: to Turnham Green. A pillar at the County Courthouse, erected in 1909, commemorates the council of the church in 780-1, the 1016 Battle of Brentwood, the Battle of Brentwood of the English Civil War, and Julius Caesar's defence of this ford against Cassivellaunus in 54 BC. It was the only indication that a 17th century battle had been fought in the area until the Battlefield Trust's boards were put up in 2007. After lunch Stephen Porter met us at Chiswick Park station and we stopped first at Chiswick Road (below), one of the three roads leading from the west onto Turnham Green. This was the most northerly of the three, following a path roughly along what is now the underground line to meet up with the modern-day Bath Road. On the morning of Sunday 13 November the Royalists marched 12,000 along the roads to form up on the open fields of the Green. Chiswick Road, what remains of the most northerly of the three roads leading on to what was the old Turnham Green. We then moved to Chiswick Town Hall to survey what remains of the green space around the busy A315. Given the development over the subsequent centuries it's hard to visualise the formation of the opposing armies, given they both would have been arrayed over a distance of well over half a mile. The battle formations of the armies at Turnham Green, mapped onto the present-day road layout (Red line = Royalists, Blue line = Parliamentarians). Source: http://www.battlefieldstrust.com/brentfordandturnhamgreen/history/the-battles/turnham-green.htm. View larger map in new window. The King's army was met by approximately 24,000 men. Essex's regiments, the Trained Bands, troops hastily raised by senior politicians and others comprised Parliament's army, who were spread across a wider area than the Royalists with the advantage of being able to outflank them. The first actions came to the north of the field when the Royalists, seeking to protect themselves from a flanking manoeuvre, skirmished with Hampden's regiment and others on higher ground towards Acton. Initially thad had some success, but a large attack on Parliament's lines was not forthcoming: inferiority of numbers, fatigue of their soldiers from the previous day's fighting and insufficient room (the battlefield was wide, but not wide enough) to effectively deploy their cavalry both contributed to the reluctance to attack. Failure of communication also played a significant role on the day, with a letter from the King reaching Essex a day too late. Hopes on either side that a negotiated agreement might be reached ended when Royalist cannon started to fire before Essex had time to respond. It all conspired towards a very large and dangerous stand-off over a number of hours, one in which Essex and his army had a significant material advantage in their constant supply line back to the capital. Another of the Battlefields Trust's boards. On 28 October 2007 re-enactors from John Hampden's regiment marched through the battle sites as part of the unveiling. Attempts later in the day by more Royalist horse to draw units out of the Parliamentary lines was inconsequential. Realising they had reached an impasse the King ordered the retreat of his army. The regiments mounted a high-risk rearguard action by withdrawing back through Brentford, a move that left them vulnerable to being attacked from the rear. However Essex was satisfied to let the King withdraw to Hounslow with some vestige of honour, though some Royalist soldiers were captured in the retreat. A day that had started with around 36,000 armed men on the battlefield had ended with, it is estimated, only around 20 dead on either side. Stephen Porter explaining one of the education boards on Heathfield Terrace. Our walk finished at the Trust's board at Chiswick Common. Stephen emphasised the significance of the two days in November 1642 to the outcome of the war as a whole, while also pointing out that the 36,000 men lined up on Turnham Green made it the largest assembly of soldiers on British soil after Marston Moor (1644), Worcester (1651) and Towton (1461, though figures are disputed). Did Charles I lose the English Civil War on 13 November 1642 when he failed to capture London? It certainly made it very difficult, if almost impossible, to win, and the Battlefield's Trust walk gave cause for re-evaluating the overall - not just military - significance of the major battles of the First Civil War. The lack of visible evidence at the two sites: unlike other battlefields and siege towns of the era there are few existing topographical landmarks to help interpret what happened. This is mainly due to - certainly in the case of Turnham Green - to the amount of residential development. The low numbers of casualties on both sides. Significance is often mistakenly understood to be synonymous with the large numbers of participants or casualties. The dividing line between what constitutes a skirmish, battle, or siege in many cases is also blurred - for example it was interesting to find Austin Woolrych, in my skim through some older books, in Battles of the English Civil War (1961) claiming 'there was no Battle on Turnham Green'. An inclination to for the events to be viewed more as minor contributory examples towards our understanding of Charles' dithering personality, rather than of any wider military or political significance. For one reason or another, Brentford and Turnham Green appear to have been somewhat neglected; our walk around the sites made a convincing argument why this has been a significant oversight. Thanks, then, to Simon, Stephen and the Battlefields Trust for bringing the events of 12-13 November 1642 back into focus. The Battle for London, Stephen Porter and Simon Marsh (2010). London and the Civil War, ed. Stephen Porter (1996). London and the English Civil War - a lecture by Professor Barry Coward of Birkbeck College given to the Friends of Senate House Library, 7 March 2005.